Ever wondered how to make your own typeface? This two-part tutorial will show you in detail how to take artwork you’ve created in Illustrator and transfer it easily across to FontLab Studio 5. Set your preferences in Illustrator before you start – see the notes at the bottom of this post. Are you using Adobe Illustrator CS5? The Rulers in AI CS5 work differently and this makes it slightly more difficult for you when you are using the horizontal guides to get the y-values. This is because in CS5 Illustrator actually has two types of rulers: Artboard rulers and Global rulers. The Artboard rulers are the new default in CS5, and unfortunately they will give you the wrong y-values. 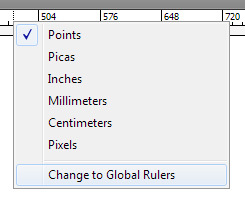 To ensure you get the correct values you need to change the rulers over to Global rulers. This is easy – simply right click on the ruler, and select Change to Global Rulers.